Books • Art historian Hikmet Sidney Loe chronicles the many influences on Robert Smithson’s masterwork in the Great Salt Lake. (Francisco Kjolseth | Tribune file photo) This Wednesday, Nov. 20, 2013 photo shows The Spiral Jetty earth works on the north edge of the Great Salt Lake created by artist Robert Smithson in 1970. When Hikmet Sidney Loe told her adviser that she wanted to write her master’s thesis in art history on Spiral Jetty, the adviser was dubious. “He said, ‘You’re not going to write a dead work of art. Spiral Jetty is dead, it’s gone, you can’t write about it,’” Loe recalled in a recent interview. This was 1993, and Robert Smithson’s earthwork, built in 1970 off Rozel Point into the northern part of the Great Salt Lake, had been submerged under several feet of water for 20 years. (Austen Diamond | courtesy University of Utah Press) Art historian Hikmet Sidney Loe, author of the new book "The Spiral Jetty Encyclo," a thorough examination of Robert Smithson's Land Art masterwork in the Great Salt Lake. “I showed him pictures and said, ‘It’s just been underwater. It’s not gone. The lake level went down, and it’s still here,’” Loe said. Thus began Loe’s nearly quarter-century fascination with the land-art masterwork, the result of which is a new book, “The Spiral Jetty Encyclo” (University of Utah Press; softcover, 384 pages, illustrated; $34.95). 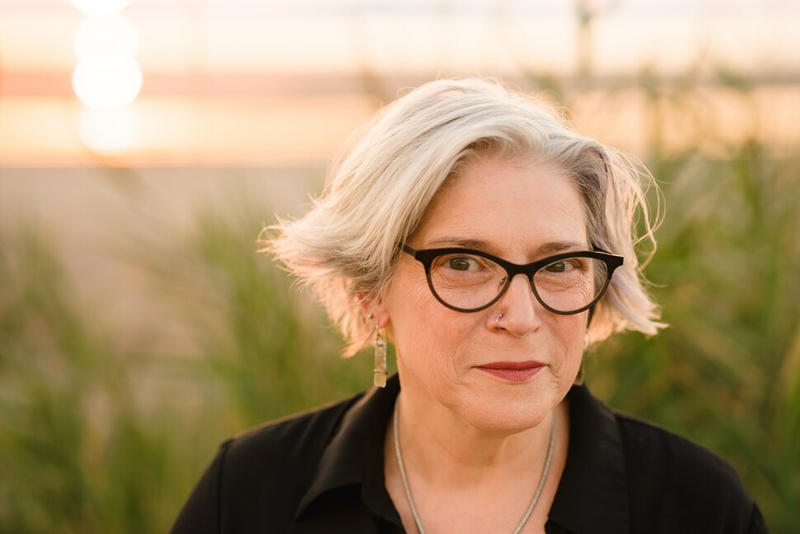 Loe will read passages from the book and screen Smithson’s documentary about its making, Wednesday, Oct. 4, at the Utah Museum of Fine Arts in Salt Lake City. In the book, Loe captures and comments on the varied influences on Smithson’s work — arranged alphabetically, from “aerial art” (his belief that his large land-art works should be seen from an airplane) to the poet William Carlos Williams (his pediatrician during the artist’s youth in Paterson, N.J.). (Francisco Kjolseth | Tribune file photo) The Spiral Jetty earth works on the North edge of the Great Salt Lake created by artist Robert Smithson in 1970 is visible on Wednesday, Nov. 20, 2013. (Francisco Kjolseth | Tribune file photo) The Spiral Jetty in 2008. (Francisco Kjolseth | Tribune file photo) The Spiral Jetty earth works on the North edge of the Great Salt Lake created by artist Robert Smithson in 1970 is visible on Wednesday, Nov. 20, 2013. (Francisco Kjolseth | Tribune file photo) The Spiral Jetty earth works on the North edge of the Great Salt Lake created by artist Robert Smithson in 1970 is visible on Wednesday, Nov. 20, 2013. (Francisco Kjolseth | Tribune file photo) The Spiral Jetty earth works on the North edge of the Great Salt Lake created by artist Robert Smithson in 1970 is visible on Wednesday, Nov. 20, 2013. (Francisco Kjolseth | Tribune file photo) The Spiral Jetty earth works on the North edge of the Great Salt Lake created by artist Robert Smithson in 1970 is visible on Wednesday, Nov. 20, 2013. (Francisco Kjolseth | Tribune file photo)The Spiral Jetty earth works on the North edge of the Great Salt Lake created by artist Robert Smithson in 1970 is visible on Wednesday, Nov. 20, 2013. (Francisco Kjolseth | Tribune file photo) The Spiral Jetty earth works on the North edge of the Great Salt Lake created by artist Robert Smithson in 1970 is visible on Wednesday, Nov. 20, 2013 as seen through a unique lens with an extreme shallow depth of field. 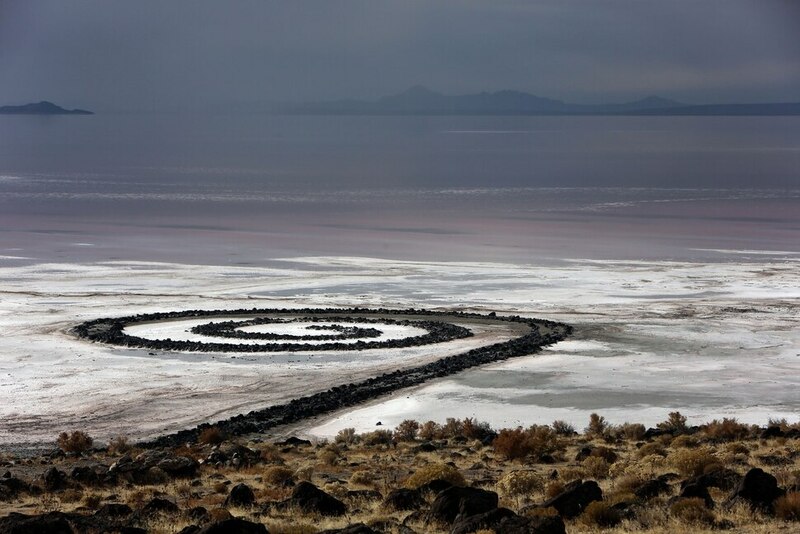 Spiral Jetty is perhaps the best-known work in the land-art movement of the 1960s and 1970s, when artists left the gallery to create large, immobile works in remote places. Smithson and his wife, Nancy Holt (who later created Sun Tunnels, in Box Elder County near the Nevada border), were among the champions of the movement. “Land art is about being at the site, and being with the work, but it’s equally about the journey,” Loe said. For Smithson, she said, part of the journey was a failed project he, Holt and artist Michael Heizer worked on in California’s Mono Lake. The project held some of the themes — an inland sea, an alkaline lake — that Smithson developed further in Spiral Jetty. The book features words and images from a film about Mono Lake, shot in 1968 and completed by Holt in 2004. Loe’s breakthrough in research was getting one of the first extensive interviews with Bob Phillips, the Utah contractor Smithson hired to dig the dirt and move the rocks that make up Spiral Jetty. Phillips showed Loe the papers he had saved, including Smithson’s drawings, photos and planning documents. 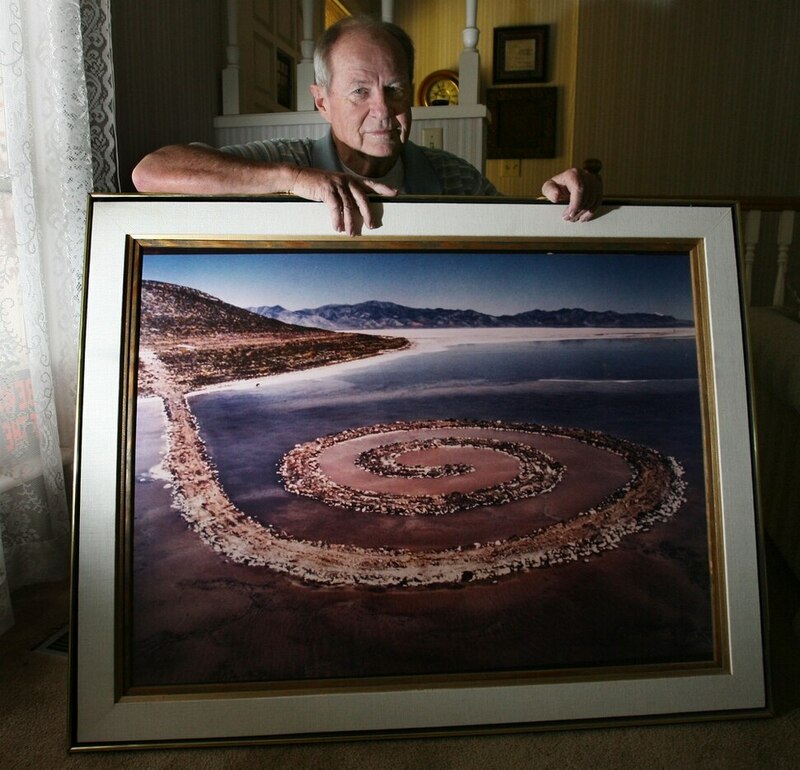 (Steve Griffin | Tribune file photo) In this 2011 file photo, Bob Phillips is pictured in his Ogden home holding a giant photograph, taken by photographer Gianfranco Gorgoni of the Spiral Jetty. Phillips was the contractor who built the Spiral Jetty for artist Robert Smithson. 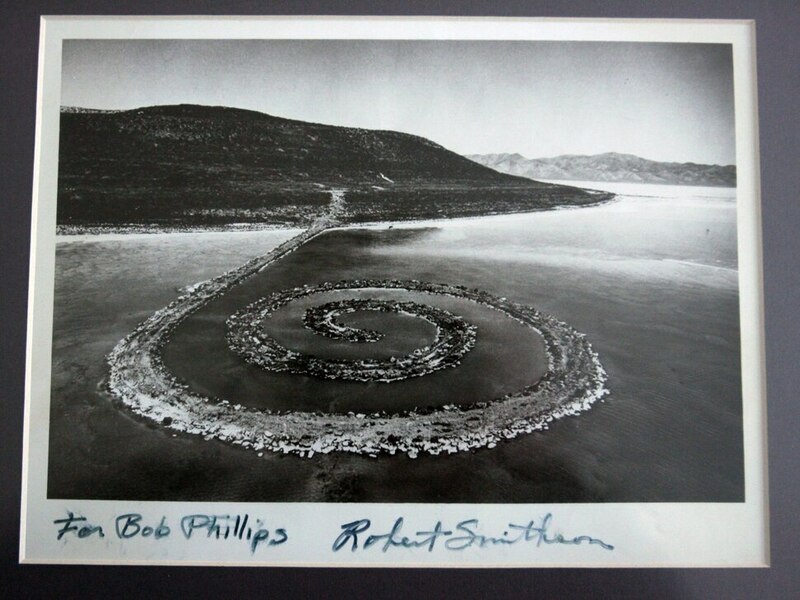 (Steve Griffin | The Salt Lake Tribune) Artist Robert Smithson gave Bob Phillips this signed photograph of the Spiral Jetty. Phillips was the contractor who built the Spiral Jetty for Smithson. (Steve Griffin | The Salt Lake Tribune) Bob Phillips looks over photos and original designs for the Spiral Jetty in his Ogden home Thursday, Feb. 24, 2011. Phillips was the contractor who built the Spiral Jetty for artist Robert Smithson. 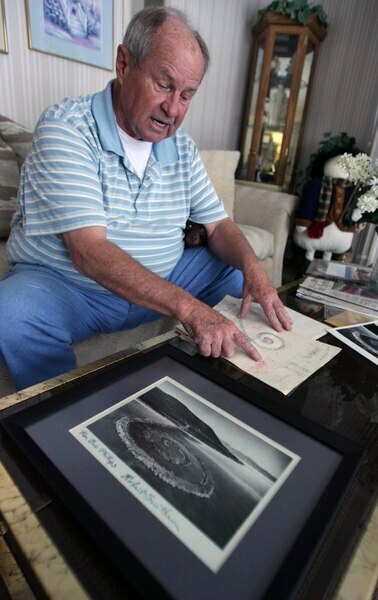 Steve Griffin | The Salt Lake Tribune) Bob Phillips looks over the original drawings for the Spiral Jetty in his Ogden, Utah Thursday, Feb. 24, 2011. Phillips was the contractor who built the Spiral Jetty for artist Robert Smithson. “He kept everything, had his own archive at home, and was very generous with me and others who were interested in Robert Smithson,” Loe said. She dedicated her book to Phillips, who died in April 2016. Phillips, she said, particularly remembered when Smithson and Holt visited him and his wife, Judy, in 1972. The Smithsons wanted to go out to the jetty, but the Phillipses begged off the trip. “Bob Phillips always was very regretful of that, because that was the last time he ever saw Robert Smithson,” Loe said. Smithson died in 1973, at age 35, in a small-plane crash while surveying a site for an earthwork near Amarillo, Texas. The waters of the Great Salt Lake rose soon after Spiral Jetty was completed. The work disappeared in 1972, reappeared briefly in 1980 and wasn’t seen again until 1993. It was visible for a few years, was swallowed up again in 1997 and has been visible ever since. At its highest, in 1987, the water rose 16 feet above where Smithson built the jetty. 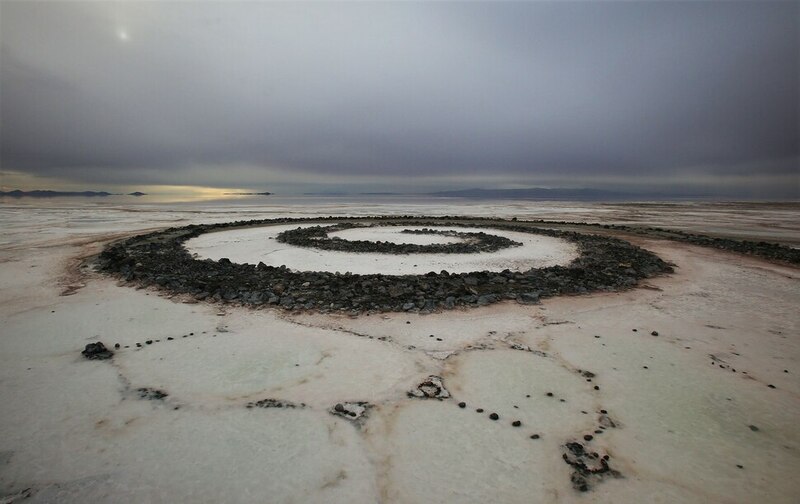 The evolving nature of Spiral Jetty was in keeping with Smithson’s philosophy of land art. When • Wednesday, Oct. 4, 7 p.m.